I actually first saw this brand of crisps on Twitter and have to admit to not quite getting it. 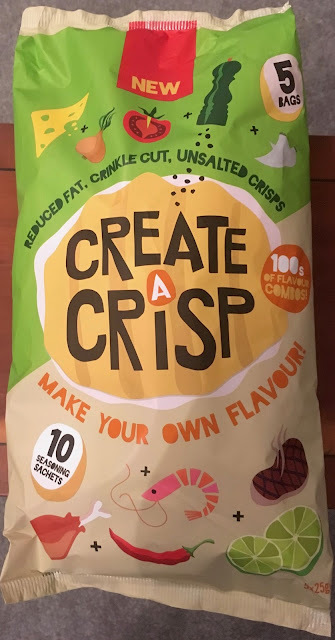 I wasn’t sure how you were supposed to create your own flavour within a multipack, so I made and effort to pick up a bag of Create A Crisp from Waitrose when I was last in. Reading the bag made the concept make a lot more sense. In side the pack are unseasoned crisps and flavour sachets which you can mix and add. There are a decent selection of flavours, from prawn, steak to garlic and black pepper. I wanted something for my first bag that sounded like it would go, but still used two flavour sachets, I went for Chicken and Thai Chilli. I opened my bag, sprinkled in both sachets, scrunched the bag closed and shook it, as per the instructions, for 20 seconds. The crisps are crinkle cut to help catch the flavour and after their good shake the seasoning was fairly evenly distributed. The flavour worked well, the chicken was meaty and the chilli added a nice Thai tang, but it wasn’t very hot. 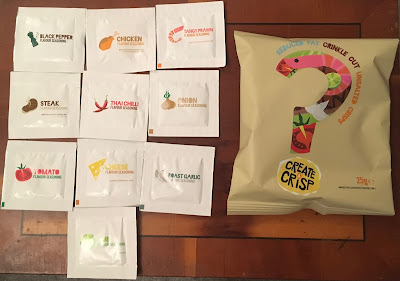 I enjoyed the crisps ever so much, and it was fun making an interesting flavour combination. I guess the real fun will be trying something a bit more out there, and seeing if you can invent a winning combination; Lime and Cheese anyone? These are really fun, they just need a good 20second shake!